Extra Judicial Killing: One more Killed. A man was killed by RAB and alleged as criminal. 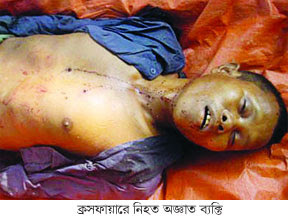 By Bangladesh Media; The daily star reports about a man was killed by Rapid Action Battalion (RAB). Referring to its Correspondent from Khagrachhari it reports that an alleged criminal was killed in a 'shootout' between his accomplices and members of Rapid Action Battalion (Rab) at Laksmichhari of Khagrachhari district early yesterday. The deceased was identified as Sumati Ranjan Chakma, 24, of Kayang Ghat in Mohalchhari upazila. Refferring to Rab sources it wrote, acting on a tip-off, a team of RAB raided a house at Jurgachhari village where Sumati along with his 10 to 12 accomplices gathered to plan some criminal activities. Sensing presence of the law enforcers, the criminals opened fire on the elite force, prompting them to fire back that triggered a gunfight, said Lt Col Zulfikar, commanding officer of Rab-7. After an hour-long gunfight, the bullet-hit body of Sumati was found lying on the ground while all of his accomplices except Laksmi Ranjan Chakma, 18, managed to flee the spot, he said. Laksmi was taken into Rab custody. He will be handed over to police after filing of a case, Lt Col Zulfikar added. At least 35 rounds of bullet were traded during the gunfight. The Daily star reports RAB members recovered three rifles, one AK 47, two pistols, 42 bullets, some sharp knives from the house. Kamrul Hassan, officer-in-charge of Laksmichhari Police Station, confirmed the incident saying that police recovered the dead body and sent it to Khagrachhari Adhunik Sadar Hospital morgue for an autopsy.